Since I kicked off my own blog on May 1, 2017 I had some catching up to do from fishing trips that had already taken place. All told, by that time I had four fishing trips and 42 bass in the log for 2017. And the bass in today’s blog banner pic was the very first of that bunch. It was a bass that I had been after since I was a teenager when I first caught this crazy bass fishing bug. For many years I’d chased a fish of the caliber that my fishing heroes triumphantly hoisted at arm’s length on TV shows, magazine covers and print ads. The stuff of a young angler’s dreams and still elusive as I became not as young. When I landed the bass above I had well over thirty years of bass fishing under my belt. That’s a lot of casts and a lot of bass but never one that weighed six pounds. I nearly made it in February 2002 with a 5-15 and I’d actually surpassed it in September 2009 with my personal best of 7-3. The latter bas was pretty cool, an awesome bass, but still blanked for the six-pounder, hopped right over the mark with that one so it still left me wishing. 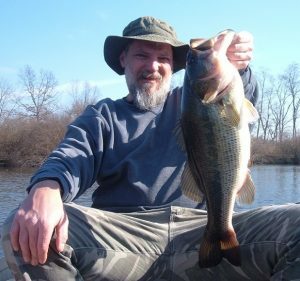 On March 4, 2017 I got my wish after a tap on my trusty black and blue jig and pig got my attention. A slight sideways movement of my line at the water’s surface got me to set the hook. And luck was on my side as despite a few rolls in an effort to shake the lure I got a bass that tipped the scales at 6-2. This bass sure meant a lot to a guy who has more than a few in the ledger dating back to the early 80s. In the original write up here on the blog I noted that “I just sat for several minutes letting it sink in.” Turns out that I could’ve sat there for the rest of the day and wouldn’t have missed a thing. My six-pounder was the first and only bite I had all day and that first bass of 2017 would be the biggest bass that I caught all year.